Vitamin B12 (or cobalamin) is a one of eight B-vitamins, each of which plays a unique role in cell metabolism. Specifically, B12 aids with brain and nervous system function and the formation of blood (all good things). For men and women over the age of 14, the recommended intake is 2.4 micrograms (mcg) per day, an amount that you could meet by eating about 3 ounces of canned tuna. Getting too little B12 can lead to anemia, which can cause you to feel tired and weak. Vitamin B12 deficiency can increase your chances of having poor mental health, skin numbness and tingling, as well as decreased cognitive function, and poor coordination (all bad things). Your best bet for consuming adequate amounts of B vitamins is to stick to whole, unprocessed foods, and especially animal products for B12. 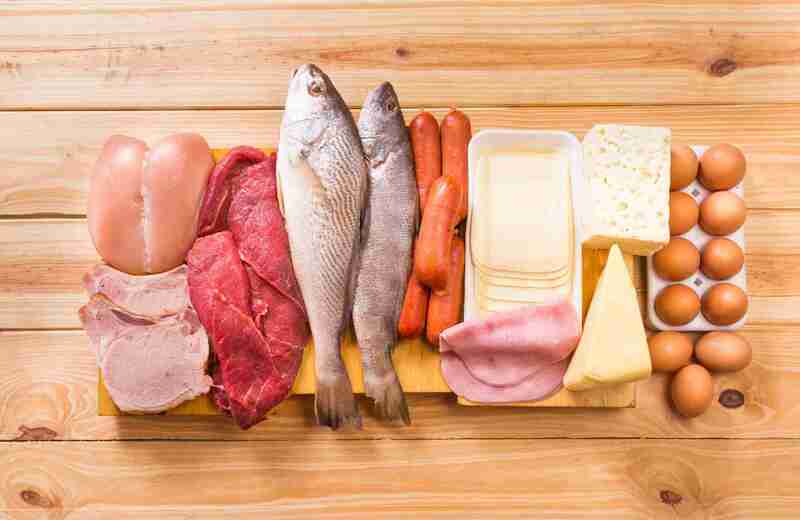 Make sure you’re working animal-based proteins, such as salmon, beef liver, ground beef, haddock, milk, cheese, ham, eggs, and chicken breast into your diet. Your InsideTracker Food Basket can help you find sources to suit both your body’s needs and your taste preferences. Even though you don’t need much B12, those who avoid animal products (such as vegetarians, vegans, or flexitarians) may have “beef” with this recommendation. Fortunately, many breakfast cereals are fortified with enough B12 to meet recommended needs without violating a vegetarian diet. Click here to learn how InsideTracker can recommend personalized diet and exercise plans that will help optimize your levels of vitamin B12! Why should athletes care about B12? Some research suggests that athletes with poor or marginal nutritional status for vitamin B12 may have decreased ability to perform high intensity exercise. In women specifically, higher B12 levels correlate with enhanced athletic performance. This is likely due to B12’s role in the synthesis of new cells, such as the red blood cells, and for the repair of damaged cells that help the body rebuild tissues. Adequate levels of B12 also provide the body with increased ability to deliver oxygen, thus possibly enhancing endurance capacity. Those who need to be especially careful of their B12 status are athletes who restrict energy intakes or eliminate food groups from their diet (such as vegetarian athletes). These populations should consider taking a supplement to ensure their cells are able to repair damage properly. Existing evidence suggests no differences among forms of B12 with respect to absorption or bioavailability. Supplements can be taken orally a pills, tablets or lozenges. Are you getting too much? Just as you can consume too little B12, you can also consume too much if you’re not eating balanced meals or are taking too many supplements. A recent study conducted by Segterra scientists analyzed blood samples from 50 healthy adults, both male and female, ranging from 18 – 79 years old. The study discovered that many of the people who were surveyed had very high levels of B12, in addition to several other nutrients. InsideTracker determines where your B12 status lies based on an analysis of your blood, which is the only way to truly know how much is being absorbed by your body. Your personalized plan will allow you to reach your optimum level if you’re not already there.